Are there Nike toddler shoes, and are they worth buying? To the first question, yes—Nike certainly produces a wide variety of shoes in cute toddler sizes. The answer to the second question is more complicated, and will depend on your budget and what you want when you go shoe shopping for your toddler. 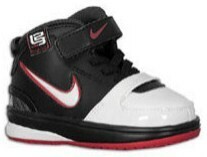 •	Quality: There’s no doubt about it; Nike shoes are quality toddler shoes. You can be completely sure that your toddler will grow out of his shoes before they wear out, and if he will have other siblings you’ll want to pass them on to, you will get your money’s worth. •	Comfort: Nike sneakers are among the most comfortable toddler shoes on the market, and you’ll be able to rest assured knowing that your child’s feet are just as cozy as they can be. •	Tread: Your toddler is setting the foundations for a lifetime of walking now, and it’s important that he has well made shoes that encourage him in good walking habit. Nike shoes are scientifically engineered to be good for your toddler’s feet and help him walk straight and tall. •	Look: We might as well admit it: Nike kicks look really cool. It’s fun to have our little people in miniature sneakers or tennis shoes that look just like mommy’s or daddy’s. And the brand name recognition doesn’t hurt either. With those three big reasons in the pro camp, what are the reasons against buying your toddler Nike shoes? •	Price: Nike shoes are expensive. Really expensive. Is that money best put in a pair of brand name shoes that your toddler will outgrow in a few months, or is there a better way you could spend it? •	Ego Watch: Why are you buying your toddler nike shoes? Is it because it’s best for him, or because having your child in name brands makes mommy look cool? Whatever decision you make about your child’s footware, make sure you make it for the right reasons. If you’ve decided to go for it and buy Nike shoes for your toddler, you probably still have lots of questions: How? Where? What kind? Outlet stores sometimes offer discount on Nike shoes for toddlers, so if you have Nike outlets in your area you’ll want to scout the discount aisle. Online is another good way to buy Nike toddler shoes; through websites like Amazon. When buying your toddler Nike shoes you should keep in mind that Nike shoe sizes run bit small; factor that in when you decide what size to buy. If you’re buying online, you can trace your child’s feet on a piece of paper and measure them to get an idea of the size you need. Shoe stores will also size toddler feet for you. If your toddler has extra wide feet, make sure you look for extra wide sizes when you shop for toddler shoes. Have fun shopping, and enjoy watching your toddler’s Nike feet go running here and there!